Time, price and menu TBA. Open bar, hour long reception with a variety of hors d'oeuvres, followed by a sit down, three course dinner with table side wine service. Discover the ultimate urban oasis, just a short stroll into New York City’s cherished Central Park. A haven for romantics and nature lovers, this understated icon offers a rare tranquility within the ever-eclectic energy that defines Manhattan. True to its name — rowboats drift about the adjacent lake, as they have for over 150 years. Whether celebrating a special anniversary, meeting an old friend for lunch or enjoying a little spontaneous refreshment—The Loeb Boathouse offers one-of-a-kind choices to satisfy all of your senses. 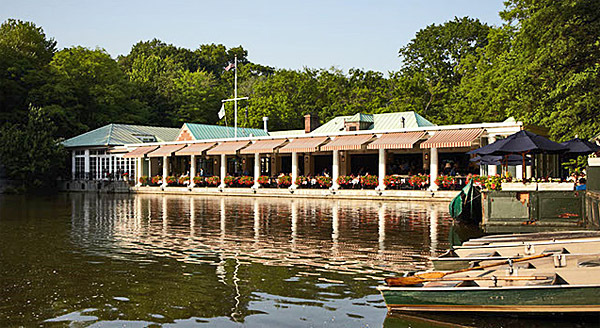 Designed to beautifully coexist with its natural surroundings, The Loeb Boathouse is the only Manhattan venue right on a lake—allowing you to host your wedding, Bar or Bat Mitzvah, or corporate event in spectacular fashion. While you’re here, why not join a 150-year-old tradition and explore the lake in a rented rowboat. Better yet, take a ride in an authentic Venetian gondola. With any luck, your gondolier might even break into song.